The Via Appia Antica (Old Via Appia) or Appian Way was Rome’s first road and Europe’s first ‘highway’. Today we introduce you to all the most important things you should know before cycling the Via Appia, the most famous road of the Roman Empire. The Via Appia was built to facilitate the movement of the armies, supplies and commerce back in 312BC. Originally it connected Rome with Capua, near Naples, but by 244BC it had been extended all the way to Brindisi in Puglia, the ‘heel of Italy’. It was 350 miles long and linked Rome with strategic ports in the South of Italy where ships would sail to Greece and the East. More roads were built afterwards but the Via Appia was the first and one of the Empire’s finest. As such it is today a UNESCO listed world heritage site. There were many more roads after the Via Antica, hence the expression ‘all roads lead to Rome’ but none of them quite as important hence its title of ‘queen of roads’, ‘regina viarum’. How long is the Via Appia? The full Via Appia trail connects Rome and Brindisi (350 miles / 563kms) but our cycling the Via Appia tour takes in the last 190kms of the route, from Formia, on the Mediterranean coast, to Rome. Our itinerary takes up to 10 nights to complete. Many monuments were built along the Via Appia over its 2300 years of history. Cycling the Via Appia from Formia you will still see parts of the original structure. You will feel like you are stepping back in time as this ancient cobbled road was used by Julius Caesar and other main leaders of the Roman Empire. The route is a symbol of the mightly Roman Empire also with its darker side, for instance it was also on the Via Antica that the famous slave leader Spartacus was crucified along with some of his followers. 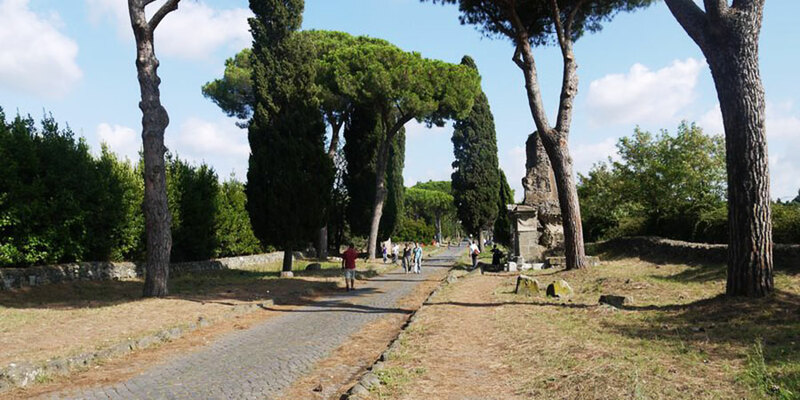 Wealthy Patrician families chose to be buried here and many of their mausoleums line the Via Appia. There are also numerous underground catacombs, some of them open to the public, such as San Sebastiano and San Callisto. Countless Roman ruins and many grand villas can also be admired along the way, including the 17th century Castel Gandolfo, the former papal summer residence. While much off the original Via Appia route has been transformed into modern roads there are still parts where the original cobbles exist. The most notable of these is the 15kms which bring you in a dead-straight line from Frattocchie into the city of Rome. Much of the existing ruins and antiquities along the Via Appia can be seen along this section. Once you arrive in Rome, you have a wealth of archaeology and historic monuments to visit, so we recommend spending at least a couple of nights in the always fascinating ‘Eternal city’. The first 80kms approximately are relatively flat but as you approach Sezze the terrain becomes more hilly and challenging. You can either travel with your bike and our team will organise accommodation and luggage transfers from stop to stop or you can talk to our travel specialists to include bike hire for your tour.